If you've not yet held your final club for the school year, the end is in sight. 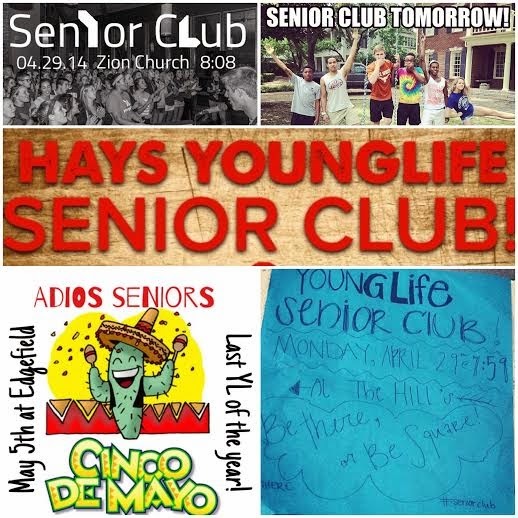 It’s become somewhat of a Young Life tradition to end each year with “Senior Club,” giving the graduating seniors a chance to lead club and share about their experiences. Also, offer prizes for the high schoolers who brings the most 8th graders. We always give away 'Lunch With A Leader' and bring kids lunch from their favorite restaurant to school. If scheduled late enough in May, often college students are back home and would love to come back and visit club. If not carefully monitored, this club could run too long. Consider starting 15-30 minutes earlier than usual. You could also do a cookout, grill hotdogs, and start at 6:37 instead of 7:37. Check the sports schedule and make sure to not conflict with a big home game. What other ideas have you seen work well? Comment below or email me here.